September is National Honey Month. Celebrate by replacing table sugar with honey in your tea, in baking and other recipes. But don’t do it because you think honey is better for you. Truth to tell, honey and sugar are so close in calories, nutrition (both have none or marginal nutrients) and glycemic index* that it really makes no difference. Some websites maintained by honey enthusiasts or vendors—as opposed to nutritionists or healthcare professionals—tout the vitamins and minerals. But these are only trace amounts. Here’s more information. This recipe is from Bee Raw Honey, which used its delicious Wild Raspberry Honey in the recipe. You can substitute the honey you have on hand. Celebrate National Honey Month in every way you can. Photo courtesy Bee Raw Honey. 1. MUDDLE the raspberries, mint leaves, lime juice and honey in a cocktail shaker. 2. ADD the rum, cranberry juice and ice. Shake well and serve in a Collins glass with fresh ice. 3. GARNISH with a sprig of mint and a few whole raspberries. *The glycemic index of agave is 32 GI and 60 calories per tablespoon (but it’s twice as sweet as sugar, maple syrup is 54 GI and 52 calories per tablespoon, honey is 58 GI and 64 calories per tablespoon and sugar is 60-65 and 48 calories per tablespoon. Calorie data source: NutritionData.Self.com. Up to one cup, honey can be substituted for sugar in equal amounts. For example, replace a half cup sugar for a half cup of honey. Since honey is sweeter than sugar, you can also use a little less. If you prefer less sweetness to more, experiment until you find the substitution proportion that suits you. If the recipe calls for more than one cup, use 2/3 or 3/4 cup of honey for every cup of sugar. You can also match the type of honey to your recipe. Here are examples of honey-food pairings. 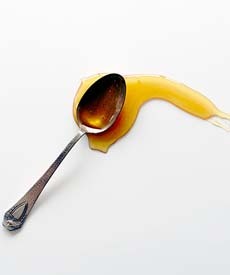 TIP: Before measuring the honey, generously coat measuring spoons and cups with cooking spray to prevent the honey from sticking. In baking, honey typically makes the product more moist and flavorful. Because baking is science, and the chemistry must work, it’s better to look for a tested recipe rather than doing your own replacements. Reduce the oven temperature by 25°F when using honey in place of sugar. 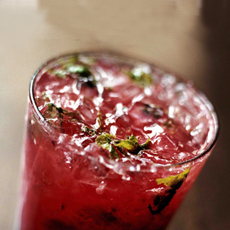 The Mojito (mo-HEE-toe) hails from Cuba; the name comes from the African word mojo, which means to cast a small spell. One story says that slaves working in Cuban sugar cane fields in the late 19th century invented the drink. However, historians at Bacardi Rum trace the cocktail’s roots to 1586, the year that Sir Francis Drake and his pirate crew made an unsuccessful attempt to sack Havana. Drake’s colleague, Richard Drake (no relation), was said to have invented a Mojito-like drink known as El Draque (The Drake). The recipe included aguardiente (a spirit similar to cachaça), sugar, lime and mint. As with most drinks of the time, it was initially consumed for medicinal purposes. Sometime in the mid-1800s, with the refinement of rum, rum was substituted and El Draque became known as El Mojito.